When I was an eager young college student in the early 2000s, I was lucky enough to take a Modern Art class from the illustrious art historian Thomas Crow, a leading critic and thinker especially on art after 1945. In his class, we covered all the heavy-hitters of the so-called New York School, painters like Willem de Kooning, Mark Rothko, Barnett Newman and Jackson Pollock. Crow was such a fantastic teacher, that unlike most of the “learning” I was exposed to in college, all of these paintings and people remain burned into my cerebral lobes. Coming to New York and visiting the MoMA for the first time wouldn’t have had its religious impact if I hadn’t been already so wonderfully indoctrinated to Newmann’s Vir Heroicus Sublimis. But Crow saved the best for last. 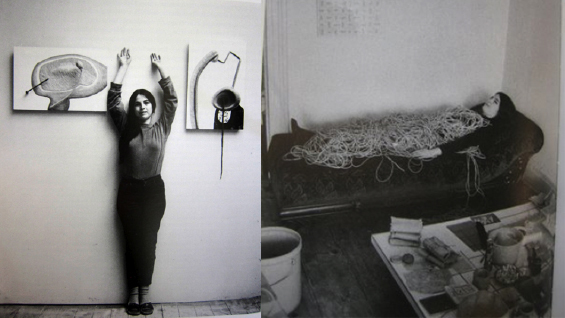 Quickly putting the machismo of those abstract expressionists aside, we left Pollock and the rest of the 1950s in peace, moving on to a young woman artist: Eva Hesse. Though she started her career as a painter, she began incorporating bits of string and metal into her “two” dimensional works, and would eventually become famous for her wildly innovative sculptures made from resin, rubber and other exotic so-called “soft” industrial materials. Lucy Lippard wrote the seminal biography on Hesse in 1976. And apart from weaving a beautiful and tragic tale about Hesse’s short life (she died from a brain tumor in 1970 at the young age of 34), the book is chock full of stunning black and white photographs. We see an incredible life in pictures: Hesse as a student with Josef Albers at Cooper Union, at her openings at the Heller Gallery, in her studio loft on the Bowery and fantastic documentation of many of her sculptures. The book was republished in 1991, and is an essential read for any aspiring art student living and studying in New York City. If you’re lucky enough to stumble across one in a thrift store or at the strand, pick up a copy!